Located in the north central part of France, in the region of Île-de-France, Paris, the capital of France, is one of the most magnificent cities in the world. Paris is called ‘magnifique’ in so many ways, one cannot count them all: Paris the 'City of Love'. Paris the 'City of Lights'. Paris is the city with some of the most extraordinary and diverse architecture in the world: it includes castles (Versaille which was built by Louis XIV, and one of the three most visited sites in France), churches (Notre Dame a fine example of Gothic architecture) and an array of charming buildings. Paris is known for its beautiful, world famous statues that are scattered throughout its city streets: Rodin’s Balzac [at Montparnasse and Raspail], the statue of Marechel Ney [at Montparnasse and Rue de l’Observitoire] that Rodin called the most beautiful in Paris. It is also known for its numerous monuments and, of course, for the most famous art museum in the world - the Louvre (formerly the fortified castle and home of Philippe Auguste). Many of the more famous museums of the world are here in Paris: the d'Orsay, the Orangery (containing Monet’s great masterworks of the pond at Giverny), the Rodin Museum, the medieval Cluny museum; all in all a total of 43 world class museums, with a total number of museums, in the Parisian area, exceeding 100. No other city in the world compares to Paris in the eyes of the gourmet! Everyday items that you can pick up in the ‘supermarche’ include delightful pates, the most luscious cheeses in the world, succulent fruits and mouth-watering patisseries and pain! And, let us not forget the coffee, the best there is, especially so when sipped while sitting at a sidewalk cafe and enjoying the parade strolling by. We have often heard of the 'Left Bank' and the 'Right Bank' when Paris is spoken of. The origin of these references is straight forward. When the early Francs floated down the River Seine [headed north toward the sea], the land to their left was referred to as the 'Left Bank'; that to the right as the 'Right Bank'. Paris’ left bank (the southern part of the city) is known for it's somewhat bohemian lifestyle; a mode that flows along the wonderful streets of Saint-Germain-de-Pres, Saint- Michel, rue de Renne, and Blvd. Montparnasse. The Left Bank is a way of life; as much the heart of the people of Paris, as the Sorbonne is the heart of Parisian university life. And, since classes, at the Sorbonne, were originally taught in Latin, the area has become known as the Latin Quarter. There is of course the Tour Eiffel that was built, in spite of near revolutionary protests, for the World's Fair of l898. Parisians were up-in-arms believing that it would be an eyesore. Instead, it became the highlight of the fair and the toast of Paris. Paris’ Right Bank is best known for its elegant and sophisticated lifestyle. Its most famous landmark is ‘Etoile’ (the Arc de Triomphe) which Napoleon ordered to be built in 1799. It was to be a replication of ancient Roman architecture to immortalize his many military victories. The most famous street in Paris is the Champs-Elysees. This boulevard caters to the world’s elite. Paris may be the fashion capital of the world, but the Champs-Elysees is the fashion center of Paris by virtue of its exclusive and chic stores and hotels. Paris boasts of more than 2000 years of history. The Gauls, of the Parisii tribe, settled in the area called Loukteih (Celtic for 'a marsh') around 250 B.C. In 52 B.C. Caesar conquered this area and named it "Lutetia", the Latin for Loukteih. In 360 A.D. Lutetia was renamed Paris (Civitas Parisiorum) by Julian the Apostate when he was proclaimed emperor of Rome. Paris offers something for everyone: its restaurants serve culinary delights (did I mention food again?). Cultural venues abound: Art Galleries, Antique Shops, gardens galore, cabarets and night clubs; there are china, crystal & perfume stores and more..... Riverboat rides, walking, biking, hiking tours, horseback riding, every notable sport, aquariums and zoos. I believe that is the 'A to Z' of it. BIENVENUE A PARIS. Paris is located in a low-lying, bowl-shaped basin in the north-center of France. The city lines both sides of the Seine River for a length of approximately 8 miles, some 90 miles southeast of the point [about 230 miles by water], at Le Havre, where the Seine flows into the English Channel. Many western European capitals are within one to two days drive from Paris. It is located 250 miles south of London, 188 miles south-southwest of Bruxelles, 654 miles west-southwest of Berlin, 322 miles northwest of Geneve, 891 miles north-northwest of Rome and 815 miles north of Madrid. By design, Paris is the transportation hub of France. The Parisian metropolis is served by the A1, A4, A6, A10, A13, A14 and A15 Auto Routes that radiate out to the rest of France. It is also the heart of a system of Routes Nationaux that feed all the areas of France. It is often said that all French roads begin from a point just outside the Gothic portals of Notre-Dame. Central Paris is the host to 6 major rail-road passenger stations, accounting for more than 500 million passengers. The lines of the national railroad system [SNCF] also fan out, in all directions, from Paris. The city is also France’s 4th largest water port [after Marseilles, Le Havre and Dunkerque], with the navigable Seine connecting directly to the English Channel and, via a network of canals, with the navigable Loire, Meuse, Rhine, Rhone and Scheldt rivers. Much of the goods, going to and from the city, move by water. The population of the Ville-de-Paris [a French département] was approximately 2,115,700 in 1999. It is one of the world’s most crowded cities with about 53,000 people per square mile, ranking it as the 4th most densely populated city in the world after Manila, Shanghai and Cairo. The region of Île-de-France, in which Paris is located, had a population of about 11 million that same year. Paris is one of Europe’s largest metropolitan areas, and Île-de-France is the most populous of the 22 French regions. The city is confined to a 22 mile-long oval perimeter that measures 5.5 miles from north to south and 7.5 miles from east to west. The Département of the Ville-de-Paris, one of the eight departments of the Île-de-France administrative Region, is in the center of the region. The climate is moderate and is lacking in extremes. The average temperature is 66 degrees Fahrenheit. The average annual rain amounts to 23 inches, and is evenly distributed over the year. Haute-de-Seine , Seine-Saint-Denis , Val-de-Marne  and Val-d'Oise . Chartrettes Leisure, economic activities, history, etc. The Region of Île-de-France is located in the north central area of France, and is in a very strategic position within the European Union. The region is the fifth most powerful economic entity in Europe. It is the world leader for international conferences, and it's markets servicing more than three-hundred-eighty million consumers. It also hosts such notable organizations such as UNESCO and OEDC. Île-de-France's beginnings stem from historical as well as from an intellectual heritage; and one of the more prestigious in the world. The historical significances in this region abounds, both architecturally and culturally. With vast numbers of museums, monuments, statuary, art and cultural landmarks, that overall outnumber those of other comparable cities within their regions around the world. The region of Île-de-France has much more to offer than just Paris though. The two Royal Palaces of Fontainebleau and Versailles are in the region, as well as other palaces or royal homes that have now been turned into government buildings or museums. Supporting over eleven million people in the region, equals approximately 20% of the population of France. With exceptional human resources employing over 50% of the highest qualified managerial personnel in France and outweighing those of surrounding European countries, and over 120,000 permanent research scientists. The Paris-Ile-de-France region infrastructure system is considered to be the most efficient in the world. With the TGV, and the region having two of the heaviest traveled to airports in the world -- they are Charles-de-Gaulle and Orly and you can view the Aeroports de Paris here, transportation overall runs very smoothly. Unless of course the trains, buses, trucks or whatever are on strike! It is conveniently located to take one to three day trips out of Paris [which of course is the heart of France] to several popular places around France such as Fontainebleau, Versailles, Giverny, Mont-Saint-Michel, the Loire Valley Chateaux and the list goes on. Since seventy-five million plus people visit Paris each year, it is the number one destination point. The regions Cathedrals are many and magnificent, and Reims is home to the cathedral where Kings were crowned. It is our favorite, but you can go to the following Cathedrals in France site to get information for regional cathedrals and abbeys. The Universities of Paris and Île-de-France are some of the best in the country, with several 'Ecoles Supérieure' you can view all the regions French universities here. Ville-de-Paris is Departement 75 [Postale Codes 75001 through 75020] includes the 20 Paris eme Arrondissements [Districts] that are located either on the right or left bank of the River Seine. This is the heart of Paris and is also located within the inner circle of the Peripherique. This is the boulevard that surrounds the 20 Centre Districts of Paris. 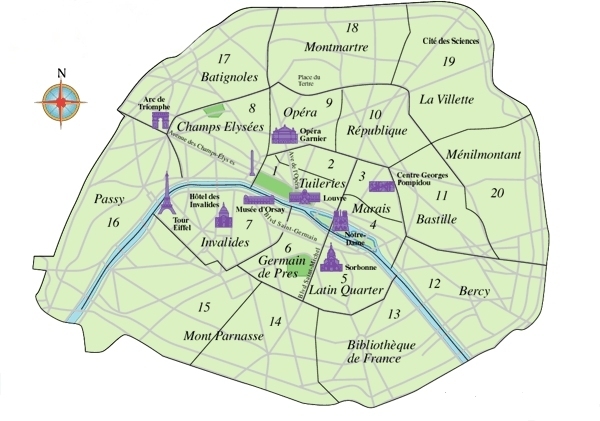 The most central districts are opposite each other at the right and left of the Seine. The 1st Arrondissement is the center of the old city of Paris and it is a great place to stay in Paris. It is located on the Right Bank (Rive Droit) of the Seine, and is home to many beautiful historic buildings, the Louvre Museum, the adjacent Jardins des Tuileries and the elegant Place Vendome. Because of its central location, hotels in this area tend to be more expensive. The advantage to staying here is that you are within walking distance of some of the top tourist destinations and restaurants in Paris and the area is very safe, as is most of Paris. The very centre of Paris and the first (numerical) of the Paris neighbourhoods. This is the least populated of the neighbourhoods but also the smallest in land area. Located primarily on the Right Bank of the River Seine, plenty of businesses and administrations are found here, but it is also a must-see for tourists: the Louvre, Les Halles, the Tuileries Gardens and the Palais Royal are all found here. The least populated of the 20 arrondissements in Paris is at the geographical center of Paris, hence the area is crammed with historic sights. The Louvre Museum, Royal Palace, Tuileries gardens, Forum des Halles, Bourse du Commerce and the upscale Vendôme Square are all located here. The 1st arrondissement also comprises the western tip of the Île de la Cité, including the magnificent Sainte- Chapelle and the Conciergerie. On the Right Bank of the Seine,, primarily business district. The Paris Stock Market (the Bourse), the Bibliothèque Nationale and the Sentier [textile market] are here. Among early inventive redeveloping the Passage des Panoramas was built, and one of the first Paris gallerias of the 19th century was built. Located on the Right Bank, this neighbourhood, together with the 8ème and 9ème, is an important business district housing a high concentration of business and financial activities, with numerous bank headquarters around the former Paris Bourse (Stock Exchange). Other key areas of interest in this neighbourhood: the Bibliothèque Nationale, the Paris Opéra and the Opéra Comique concert hall are here. The 2nd Arrondissement is also located on the Right Bank and is principally known as the stock exchange and business district. The eastern end contains the garment district. While this is not an exciting tourist destination, it is a safe and quiet area with more affordable accommodations. On the Right Bank of the Seine,, this neighborhood makes up the quieter part of the Marais, one of the oldest neighborhoods in Paris with one of the oldest homes dating back to the 13th century. Many 17th century mansions that once housed the noblest families in Paris are still to be seen in this quiet neighborhood. Located on the Right Bank, this arrondissement includes the northern and more peaceful part of the district called Le Marais, one of the oldest neighbourhoods in Paris, while the southern part of the Marais is found in the 4ème. One also finds an eclectic blend of some of the oldest noble houses still standing in Paris, side by side with the upcoming Chinatown area. As shown on the Paris Arrondissement map above, the 3rd Arrondissement encompasses part of the Marais district, a former swamp that is now a trendy, art-filled neighborhood. This safe area also has a great Jewish quarter with excellent restaurants and shops. Be sure to check out the lovely Musée Picasso while you are here. On the Right Bank of the Seine, and medieval district . . . the Marais, this is hubbub of neighborhood activity, pretty little streets, trendy cafes, restaurants and bars, and considered the gay area of Paris. The rue des Rosiers is the Jewish Marais district called the Pletzl, with charming shops and a noted fashions. Located on the Right Bank, this area hosts the heart of the more lively part of the Marais, known today for being the gay district as well as for its extensive choice of trendy bars, shops, and restaurants. Among the musts for visitors here: the old Paris City Hall (dating back to the Renaissance), the famous Place de Vosges (of the same era), the Pompidou Centre (ultra modern in style), the Ile de la Cité, with Notre-Dame de Paris and the Ile St. Louis (the oldest parts of Paris). The 4th Arrondissement is at the heart of Medieval Paris. Many prominent tourist sites such as Notre Dame, St. Chapelle, and the National Museum of Art in the Pompidou Center are all here. The Marais spills into the 4e arr. and contains the Place des Vosges, known as the most beautiful square in Europe. On the Left Bank of the Seine, is the fabled Latin Quarter. This neighborhood takes its name from the Sorbonne, where Latin was the common tongue for all students during the Middle Ages. The neighborhood has the feel of a small village and students mix freely with professionals in its winding streets. The rue Mouffetard is a primary artery where shops, international restaurants and student bars and cafés are found. A district dominated by universities, colleges, and prestigious high schools. Located on the Left Bank, this arrondissement’s claim to fame, among others, is its Latin Quarter, the famous Village made of small winding streets - one of the oldest areas of Paris dating back to ancient times when Latin was spoken - and now housing famous universities, colleges and high schools. The rue Mouffetard is a primary artery where shops, international restaurants and student bars and cafés are found. The 5th Arrondissement is located on the Left Bank (Rive Gauche) and has been known as the Latin Quarter since the early 13th century because the Sorbonne University professors and students all spoke Latin. It is still considered to be the intellectual center of Paris, and is now filled with a variety of bohemian restaurants and bookshops. The 5th Arrondissement is also in close proximity to the glorious Luxembourg Gardens . Foodies will enjoy the food shops and cafés on Rue Mouffetard. botanic garden, the Jardin des Plantes. On the Left Bank of the Seine, is St. Germain des Pres, the Abbey founded in the 6th century. Once the hangout for bohemians and intellectuals, this neighborhood has undergone gentrification and is now newly chic. Upscale boutiques, art galleries, and restaurants can be found throughout this district. Located on the Left Bank, this arrondissement has now become a chic neighbourhood, and is home to the area of Saint-Germain-des-Prés, where one can admire the 6th century Abbey. Also in this area: upscale boutiques, art galleries, and restaurants, as well as the lovely Luxembourg Gardens, where the French Senate is found. The 6th Arrondissement, also known as St. Germain de Prés, is a colorful part of the Left Bank that was once the favorite haunt of Ernest Hemingway and the artist Eugène Delacroix. Today you can stroll the famous Boulevard St. Germain, or find the former homes of famous authors on Rue Jacob. The gorgeous Luxembourg Gardens are in this district as well. Travel Tip CK OUT: The little street in this district, called Cherche-Midi has some great little local restaurants including Midi Vins at 83 Cherche-Midi. eponymous neighborhood, which is one of the most popular areas to stay in for visitors, and one of the most reputable music schools in Paris, the Paris Conservatory (Conservatoire de Paris). But mostly to enjoy the laid-back Parisien lifestyle offered in the Latin Quarter. On the Left Bank of the Seine, is where to find the world famous monument the Eiffel Tower, the Musée d'Orsay the French National Assembly, Hotel de Invalides [Napoleons resting place] and is a very aflluent neighborhood. Located on the Left Bank, this arrondissement is an important destination for certain businessmen and politicians, as it is home to many French institutions, among which the French National Assembly and various ministries. Of no lesser importance for the visiting tourists, highlights of this rich neighbourhood are the Eiffel Tower, the Musée d'Orsay and the Hôtel des Invalides, where one can admire Napoleon’s impressive burial site. The Eiffel Tower, one of the most recognized landmarks and European tourist attractions in the world, is located in the 7th Arrondissement. The Invalides, which holds Napoleon’s tomb, and the Musée d‘Orsay are also found here. The controversial Musée du Quai Branly (African and Oceanic arts museum) is also located in this arrondissement. On the Right Bank of the Seine, This upscale neighborhood is in fact quite diverse. The area around Champs Elysèe, Arc de triomphe, Place de la Concorde, and Elysee Palace [official res of French Pres], between the Champs Elysee and Place de la Madeleine you will find a mixture of 19th century buildings intermingled with businesses, and close to the Opera. Boulevard Haussmann and its large department stores of Galeries Lafayette and Printemps. And part of the business center located around the Opéra. The Right Bank’s 8th Arrondissement is where you’ll find the glitz, glamour, and elegance of Paris. The Champs- Elysées, Arc de Triumph, famous fashion houses, elegant hotels and restaurants are all in this exciting and beautiful arrondissement. You may pay a little more for a hotel here, but the convenience and beauty is worth it. Travel Tip: For the best restaurant prices and authentic French food, don’t eat on the Champs-Elysées. These restaurants are geared for tourists and the value is not good. Opt for somewhere on one of the small winding streets that branch off of the Champs- Elysées. One exception to this would be the famous Ladurée (located on the Champs-Elysées), which is worth every euro. Located on the Right Bank, this arrondissement houses a very diverse and upscale neighborhood. Primarily a business area around that includes the Opéra, along with the 2ème and 9ème arr. it is also a trendy leisure destination with areas such as the Champs-Elysées (known for its boutiques), the Arc de Triomphe and Place de la Concorde. The French Presidential residence, the Elysée, is also found here. also features the temple-like Madeleine church and the romantic Monceau Park. On the Right Bank of the Seine, A diverse residential area popular among an artistic crowd. Ths Southern portion is similar to the 2nd arrondissement, with a mix of residential and business buildings. The Paris Opera is located here. Farther North is Pigalle, the fading Red Light district as well as the famous Moulin Rouge. the Gare du Nord and the Gare de l'Est. Built during the 19th century, these two terminals are among the busiest in Europe. Located on the Right Bank, this is a mixture of residential and business area (along with the 2ème and 8ème arr. ), around the Opéra. Among key attractions here one finds the Boulevard Haussmann with its famous department stores Galeries Lafayette and Printemps, and the notorious red light district, Pigalle, with the famous Moulin Rouge. When staying in the 9th Arrondissement, you will see that it holds both the most elegant and the most tawdry areas of Paris. Pigalle, where you’ll find the now time-worn Moulin Rouge and adjacent strip joints is here, but closer in you will see the Palais Garnier, Paris’ elegant Opera house. Travel Tip: Be sure to visit the opera; its ornate décor is over-the-top and the Chagall painted ceiling is worth the price of admission itself. magnificent opera house. Nearby is the Galeries Lafayette, a well-known department store. The majestic Sainte-Trinité church is also located in this arrondissement. The two great train stations in Paris are here, the Gare de l'Est and the Gare du Nord. This multi-cultural neighborhood also contains a bohemian element.The 10th arrondissement also contains a large portion of the Canal Saint-Martin, linking the northeastern parts of Paris with the River Seine. Located on the Right Bank, this arrondissement, with its multi-cultural atmosphere, houses two of the busiest railway stations in Europe, and among the major ones of Paris the Gare de l'Est and the Gare du Nord. The 10th Arrondissement centers on the Canal St. Martin and the restaurants and cafés that line its banks. The streets along the canal become car-free zones on Saturday afternoons/evenings, and all day on Sundays to make way for the cycling and rollerblading hoards. Two great train stations, Gare du Nord and Gare de l’Est, are located here as is the historic Place de la République on the south end of the arrondissement. This area has become quite trendy in recent years. Train stations tend to attract itinerants and pickpockets; be on the alert. Located on the Right Bank, this is one of the most densely populated arrondissements in Paris, as well as being a fun and diverse area. The residential areas are to the east and to the west, this latter offering large markets and parks around the Place de la Bastille and Place de la République area, while the more lively area is found around rue Faubourg St Antoine, where one finds trendy bars, restaurants and cafés as well as boutiques and galleries. The Opera Bastille has helped to revitalize the once dreary 11th Arrondissement. There are more than a few good restaurants here to tempt you as well. Travel Tip: This is a great place to stay. The area is safe and less expensive than the closer arrondissements. There are also plenty of good restaurants within walking distance. A very low profile arrondissement, mostly residential. The Oberkampf district in the north is better known for its nightlife than its landmarks, but it does contain the Cirque d'Hiver (winter circus) and the St. Ambroise church. On the Right Bank of the Seine, Residential neighborhood bordered on the east by the Bois de Vincennes ( a nice park ). of Cours-Saint-Emilion and Bercy, which now contain the French Ministry of Finances and the Bercy arena. The 12th arrondissement contains the Opéra de la Bastille, the second largest opera house in Paris. It was inaugurated in 1989, on the 200th anniversary of the storming of the Bastille. The Bois de Vincennes is also located in this arrondissement. Located on the Right Bank, this is primarily a residential where one also finds the French Ministry of Finances. Other attractions in this neighbourhood are Opéra Bastille, second largest opera house in Paris, and the lovely park Bois de Vincennes. The large Bastille Opera can be found in this mostly residential area, as well as the Bercy Stadium and the nearby modern Bercy Park. The arrondissement is bordered by the expansive Vincennes park on the east. The 12th Arrondissement has been totally revitalized and is now the new, trendy spot in Paris for the younger crowd. Known as Bercy, this area is considered by many to be the “new Saint-Germain”. The métro meteor (line 14) makes Bercy a short 10 minutes from the Madeleine stop in the center of Paris. Travel Tip: The Parc de Bercy is a 26-acre garden at one end of this Arrondissement; at the other end you will find the restaurants, shops, and cinemas that are infusing this area with new life and excitement. On the Left Bank of the Seine,, Residential neighborhood, as well as Paris' Chinatown. is home to Paris's main Chinatown, which is located in the southeast of the arrondissement in an area that contains many high-rise apartment buildings. Located on the Left Bank, this arrondissement is primarily a residential area and home to many Paris high-rise apartment buildings, as well as housing Paris’s main Chinatown. Among the attractions in this area one has the Bibliothèque nationale de France. A largely residential neighborhood with the modern National Library as its most significant landmark. The 13th arrondissement is also home to the city's largest Chinatown. The 13th Arrondissement centers on the Gare de Austerlitz, and is another area that has little to offer the tourist, unless you have a passion for tapestries. The Manufacture des Gobelins (a textile manufacturer) is located here at 42 ave des Gobelins. On the Left Bank of the Seine, Montparnasse and the Cité Universitaire are found in this residential district traditionally known for its lively cafés and restaurants around the Blvd. Montparnasse. contains most of the Montparnasse district, which has traditionally been home to many artists as well as a Breton community. The district is today best-known for its skyscraper, the Tour Montparnasse, and its major railway terminus, the Gare Montparnasse. The 14th arrondissement also contains the Cité Internationale Universitaire de Paris, which is located near Parc Montsouris and Stade Charléty. Located on the Left Bank, this arrondissement is best known for the lively Boulevard Montparnasse in its Montparnasse district, originally home to many artists, as well as for the Cité Universitaire de Paris. Largely residential, the 14th Arrondissement is best known for Montparnasse (both the station and the towering skyscraper (Tour Montparnasse), the Paris Catacombs, and the Parc Montsouris. The Cité Universitaire is also found in this district as well as lively cafés and restaurants around the Boulevard du Montparnasse and the rue Daguerre. Travel Tip: The northern end of the district was the home to many American ex-pats and other famous members of the literati; Hemmingway, Henry Miller, F. Scott Fitzgerald, T.S. Eliot, Alice B. Tolkas, Gertrude Stein, to name but a few. At the southern end, you’ll find a quiet residential area. On the Left Bank of the Seine,, This large primarily residential neighborhood ranges from very upscale in the area bordering the 7th arrondissement and the Seine, to relatively safe and affordable in the more outlying areas. Situated on the Rive Gauche (left bank) of the River Seine and sharing the Montparnasse district with the 6th and 14th arrondissements, it is the city's most populous arrondissement. The Tour Montparnasse – the tallest skyscraper in Paris – and the neighbouring Gare Montparnasse are both located in the 15th arrondissement, at its border with the 14th. The 15th arrondissement also contains the Porte de Versailles exhibition centre and the high-rise district of the Front de Seine (or Beaugrenelle) located near the Eiffel Tower. Located on the Left Bank, this is one of the most densely populated arrondissements in Paris, that is part of the Montparnasse district (together with the 6ème end the 14ème) and part of the wealthier environment found in the bordering 7ème. in the west is one of Paris's most interesting modern parks. The 15th Arrondissement is a quiet residential area that was once the home of the artists Mogdliani, Chagall and Leger. There are few tourist sights here except for the Parc de Expositions. The 16th arrondissement hosts several large sporting venues, including: the Parc des Princes, which is the stadium where Paris Saint-Germain football club plays its home matches; Roland Garros Stadium, where the French Open tennis championships are held; and Stade Jean-Bouin, home to the Stade Français rugby union club. The Bois de Boulogne, the second-largest public park in Paris, is also located in this arrondissement. area. Among key areas of interest in this arrondissement one finds Avenue Foch, Bois de Boulogne and Trocadéro. Even if the 7th arrondissement may be even more exclusive, the 16th arrondissement has the reputation of being the richest, and only the better-off are able to pay the high rents here. The arrondissement is bordered by the enormous Boulogne park to the west. Its only tourist attraction of sorts is the Palais de Chaillot, from where you can have a great view of the Eiffel Tower. The Palais de Chaillot is also home to several museums and a theater. The Musée Guimet, a museum with a collection of Asian art, can be found nearby. The former village of Passy, the 16th Arrondissement, is a lovely residential area that holds great charm for the tourist who is looking for refined calm. This safe arrondissement has beautiful boulevards, such as the ave d’Iena, ave Foch and ave Victor Hugo as well as the exquisite Bois de Bologne Park. Some wonderful museums are here, including the Guimet, the Marmottan, and the Balzac. And you can get a great view of the Eiffel Tower, just across the river, from the place de Trocadero. Located on the Right Bank, this arrondissement is very diverse, with its working-class area by Place de Clichy and a very upper-class area by Avenue des Ternes. Among key areas of interest in this arrondissement one finds the large exhibition centre Palais des Congrès and the famous skyscraper hotel Concorde Lafayette. The 17th Arrondissement is pretty much a nice residential area and has few tourist sights. It borders on the Arc de Triumph and can be a good lodging choice if you don’t mind being a bit away from the city center. Travel Tip:The nearby La Defense business district has many hotels and is a safe and clean area. located at the western tip of the arrondissement. On the Right Bank of the Seine, Montmartre. This artsy residential neighborhood has a small village feel and lots of tourists. is mostly known for hosting the district of Montmartre, which contains a hill dominated by the Sacré Coeur basilica, as well as the famous Moulin Rouge. contains the African and North African district of Goutte d'Or which is famous for its market, the marché Barbès, where one can find various products from that continent. Located on the Left bank, this arrondissement is famous for its Sacré Coeur basilica, found on the hill in its Montmartre district, as well as for the notorious Moulin Rouge. Also in this arrondissement one finds the African and North African districts, well-known for its market marché Barbès. tourists. The Sacré-Coeur basilica and the Place du Tertre are the biggest tourist draws. The 18th Arrondissement, one of the most popular outer areas of Paris, Montmartre, attracts many visitors to its colorful street artists and stately Sacre Coeur church. Some of the world’s greatest artists lived here, notably Picasso, Matisse, Max Jacob, Utrillo and Renoir. There are some charming eateries in this area. Travel Tip: Unfortunately, the area is now also home to prostitutes and souvenir shops. And some of the “street artists” are rip-off artists as well; don’t feel obligated to buy anything you did not ask for, even if they made it “just for you”! Watch out for people trying to tie bracelets on your wrist. They will trick you into buying them. Keep an eye on your wallet when you’re in this area. On the Right Bank of the Seine, The Parc des Buttes Chaumont. A residential neighborhood with many ethnic restaurants and shops. is crossed by two canals, the Canal Saint-Denis and the Canal de l'Ourcq, which meet near the Parc de la Villette. The 19th Arrondissement, an ethnically rich area, is home to the Museum of Science and Industry, an absolutely wonderful museum. You will also find the Buttes-Chaumont which is a great place for children to enjoy donkey rides and puppet shows. Travel Tip: There are some excellent African and Middle Eastern restaurants in this area that offer quality cuisine for low prices. Look to see which ones are bustling with locals and eat there. On the Right Bank of the Seine,Belleville and the Père-Lachaise cemetery. An outlying residential area that is becoming yuppified. It contains the cosmopolitan districts of Ménilmontant and Belleville which have welcomed many successive waves of immigration since the middle of the 19th century. Today, Belleville contains the second largest Chinatown in Paris. The 20th arrondissement is also internationally known for hosting the Père Lachaise Cemetery where one can find the burials of many famous composers (such as Chopin and Rossini), writers (including Oscar Wilde and Marcel Proust), painters (Pissarro, Jacques-Louis David and others). The 20th Arrondissement is another ethnically diverse area. People from all of France’s former empire can be found here, bringing their own cultures with them. The most famous landmark is the Père Lachaise Cemetery that is the final resting place for Oscar Wilde, Isadora Duncan, Colette, Edith Piaf, Jim Morrison of the Doors and a host of other celebrities and politicians. One of Paris's most interesting parks, the Parc des Buttes-Chaumont, is in the middle of this large arrondissement. Another, more modern park, the Parc de la Villette, contains the city's popular science museum. Located on the Right Bank, this arrondissement offers a multi-cultural environment in its districts of Ménilmontant and Belleville, this latter being the home to the second largest Chinatown in Paris. Among its key attractions is the world famous Père-Lachaise cemetery, burial ground to the likes of composers such as Chopin and Rossini, writers such as Oscar Wilde and Marcel Proust, painters such as Pissarro and Jacques-Louis David, and the more modern celebrity rock singers Jim Morrison.